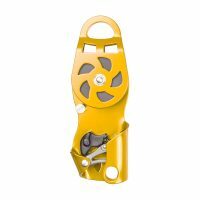 Locking cam pulley specifically designed for technicians to aid hauling of equipment and materials. 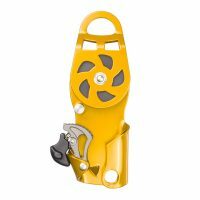 The CYCLONE is a heavy duty hauling pulley with locking cam for demanding environments. Specifically designed for technicians to aid hauling of equipment and materials. X-Cam has a more advanced tooth design than traditional cams and is more suitable for industrial applications as it does not pluck the rope, so reducing rate of rope wear. Simple, clean design for ease of rigging. Low friction integral pulley wheel. Unique ‘X Cam’ locking mechanism. Does not jam, even against knots. 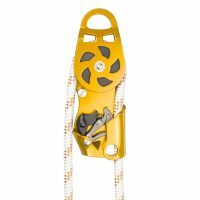 Provides high degree of grip on ropes of varying condition including rupture of the sheath. 100 kg safe working load. 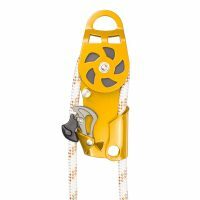 For use with 10.5 mm to 11.0 mm diameter rope. NB: The CYCLONE is not certified for lifting persons. The CYCLONE is a core component of our Basic Lifting Kit a complete lifting kit for hauling small to medium sized loads. The stainless steel CYCLONE is at home onshore or offshore as the low friction nylon pulley wheel and stainless body afford high strength and high corrosion resistance even in the most demanding of environments.